Mysuru: In a bid to familiarise the delegates attending the ongoing 83rd Akhila Bharat Kannada Sahitya Sammelana with the city’s renowned writers, poets and institutions, the Tourism Department launched ‘Kaviraja Marga’, a tour around the city for delegates, this morning. Today being the first day, 55 registered delegates were taken in a KSTDC from Maharaja College grounds, the main venue of the meet, to first visit late English author R.K. Narayan’s house in Yadavagiri, which has been converted into a museum. 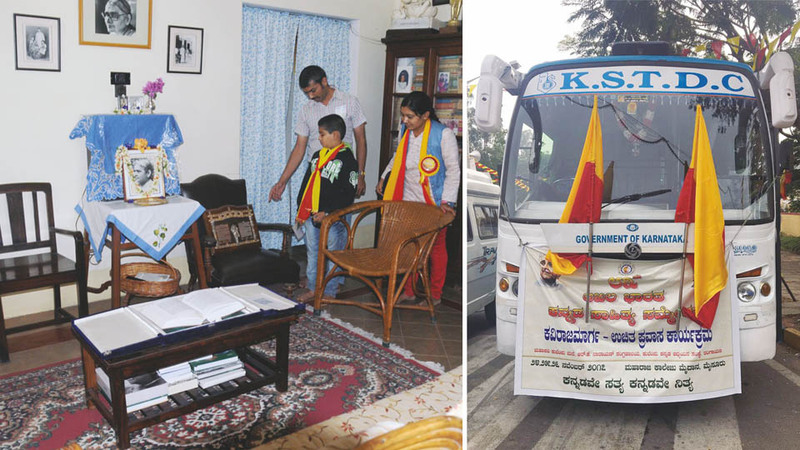 Later, the delegates were taken to ‘Udaya Ravi’, Kuvempu’s residence at V.V. Mohalla, where kuvempu’s daughter Tarini and son-in-law Dr. K. Chidananda Gowda welcomed the guests. The delegates were also taken to Kuvempu Institute of Kannada Studies (KIKS) at Manasagangothri, where they were introduced to the Institution’s functioning. Thereafter, they were taken to Rangayana where they were educated on the repertory’s activities and the tour ended at the Mysuru Zoo. The two-day tour programme will end tomorrow.